← TONY DOHERTY. Review of Hugh Mackay’s “Australia Reimagined – Towards a compassionate, less anxious society”. TSEEN KHOO. What Anzac Day meant for Asian Australians. This year, just before ANZAC Day, I read a poignant, insightful piece by Nadine Chemali about what new migrants to Australia really thought about Anzac Day. I held Chemali’s optimistic piece in mind as I reflected on Anzac Day more broadly, and what it can mean for Asian Australians. The day can signal and embrace former war-time foes as contemporary allies. Recent accounts of Turkish Australian Anzac Day connections, for example, mobilise sentiments around mutual commemoration and narratives where the enemy is transformed into ‘one of ours’. Descendants of Turkish soldiers who were at Gallipoli have been allowed to march in Anzac Day parades, and have been considered by some as ‘a very honourable enemy‘. It can also be a day, however, that mobilises the easily ignited racist sentiments around Australians and war, particularly about who ‘the enemy’ might still be seen to be. For Asian Australians, there is the overlying, sustained influence of Yellow Peril rhetoric to contend with, as well as the tendency to conglomerate Asians into a cohesive or interchangeable group. This can be a matter of life and death, as the murder of Vincent Chin (a Chinese American man mistaken as Japanese) demonstrates. My family was once abused by neighbours when we first came to Australia; they yelled at us to ‘go home to Kampuchea’. Being mistaken for a member of other Asian cultural groups in Australia is a common experience. For Japanese Australians, the connections with Australia’s war-time history continues to be particularly fraught. Whether they are early or more recent migrants to Australia, Japanese Australians have many narratives and expressions of complex identities that are now gaining voice. Mayu Kanamori, a Japanese Australian photographer and writer, writes in ‘Don’t mention the war‘ of the complex identity negotiations she works through in Australia. Of her feelings when she returned to Australia in 1996, Kanamori says she felt ‘guilt from the colonialist history’ of her heritage, and conflicted about the sensationalist headlines commonly used by Australian newspapers (for whom she worked) when it came to reporting on war-time commemorations. In addition, Japanese Australians’ history here includes internment and prisoner-of-war (POW) camps, which have only garnered broader attention relatively recently. Cowra, the regional New South Wales town, has turned its notorious history as a site of a mass prisoner-of-war breakout into major part of its tourism strategy. This element has shifted from more sensationalist renditions of the history to today’s sophisticated engagement with international partners, universities, and Japanese Australian groups. For example, started in February 2018, the Cowra Voices project creates a textured, geo-located narrative trail that focuses on the town’s initiatives in peace and reconciliation. The continued focus in research and writing about ANZAC and Australia’s other war-time histories continue to extend and enrich understandings of the events, and increasingly educate us about the roles of diverse Australian groups whose experiences during this period are less well-known. Recognising our Chinese ANZACs and knowing more about the extent of Indian involvement in Gallipoli goes some way to countering simplistic treatments of that history and how groups might signal ‘enemy’ or ‘ally’. Australia’s history of treating Asia and Asians as threats gives rise to repeated bouts of xenophobic politics that inform how Asian Australians may experience national days such as Anzac Day. Sometimes, it’s not just about getting the history more correct, or done ‘better’, and having it known. This article was first published in Eureka Street on the 7th of May, 2018. 4 Responses to TSEEN KHOO. What Anzac Day meant for Asian Australians. My father and his two brothers were soldiers during the Second World War. Their attitudes to ANZAC Day were much less jingoistic and xenophobic than the views we get today. They certainly did not regard ANZAC as the birth of our national identity. The mythology has been a political fairytale, because of a dearth of political imagination. You are raising important issues. While teaching at a university in Western Japan I became friendly with a Research Fellow – scientist – working in one of the laboratories. We shared some appalling coffees (refillable for no extra charge) in a Family Restaurant nearby on many a Saturday night as we compared our cultures and upbringings (pretty similar – we decided) – but hey – I had some family connections out of his West Bengal – and one of my favourite writers in Australia was Mena Kashmiri Abdullah (who wrote with Ray Mathews)! It’s a small world. On a visit to Gallipoli some years ago I photographed the graves of Indian troops buried at one of the important shore-side cemeteries of Australian ANZACS. And in Japan I visited a number of memorials and places associated with Australian PoWs (including of Tom UREN) as well as the Wor Graves BCOF-associated graves at Gonta-zaka in Hodogaya-ku in Yokohama. Of, and found WWII Aussie Japanese soldier – son of the Swan Hill area rice growing Pioneer TAKASUKA Isaburo (Jo). In my many years in Japan I met a couple of chaps who had been part of the Cowra (suicide) Incident/Breakout of early August 1944. Just a year earlier there had been a similar such suicide breakout in New Zealand – at Featherston – north of Wellington. It wasn’t that we didn’t know the likelihood. Both men I meet felt it had been a kind of blind and dark spell out of which – with survival – they felt reborn. One (MORIKI Masaru) wrote about his experiences – re-visited Cowra – his book translated by the Japanese-born wife of one of my distant cousins – living in Wodonga. As it turns out – she was the best mate in school in Miyazaki-ken – of my pen-friend from age 13 – though this was not something we uncovered till some 25 years later when I was tracking family members. There is far too much concentration on a kind of glorification of War-Service – of saying that those who were actually sacrificed to political ends – were fighting for our freedoms – and “lifestyles” I have heard said! I learned a lot during my time in Japan – about the subjugation of the population to the pursuit by the militarists in charge during the 1930s and war years of their expansionist aims through China and down to Indonesia (their supplies of petroleum from the till then Dutch East Indies – the blocking of which by the US triggered the attack on Pearl Harbor). I understood how the ordinary people suffered – one of private conversation students (the daughter of a noted Admiral – Guadalcanal/Coral Sea battles) basically missing out on her secondary studies in order to work in munitions/matériel factories! And hunger. And the loss of sons and husbands to the madness of the military rulers. To blame “The Japanese…” makes sense only as a propaganda slogan. The population generally heaved an enormous sigh of relief with the ending of the war elliptically announced by the Emperor Showa on August 15, 1945. Sons and husbands might come home – they might all live, after all. It’s no wonder the Occupation proceeded in some senses – as smoothly as it did. 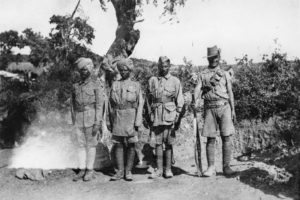 Though there were some unsavoury blips – as Allan CLIFTON wrote about in his book “Time of Fallen Blossoms” the rapes and thefts and so forth of some of those signing up for BCOF (British Commonwealth Occupation Forces) postings. An acquaintance once told me her father – six or seven children here – had another family up there – her half-brothers and sisters in Japan she never got to know – somehow stumbling upon that secret I think with her father’s death. As I recall once saying in the late 1980s to a gentle-faced smiling grand-mother – the President of a local CWA group – who told me she hated “the Japs” when I was introduced as the teacher of Japanese at the local high school – well – I was born after the War – as indeed most Japanese were – that in fact even those who had served in the war could hardly have been held responsible for that war – largely prompted by those born in the late 19th century. Oh, she smiled back at me, my son keeps telling me that! And good on that son, I thought to myself. Those otherwise unchallenged comments cow others into silence – a kind of acquiescence that bigotry is okay – the free speech spoken of so much by those forces of the right who wish for unfettered non-PC (dis-respectful) and racist kinds of speech! Shock-jocks! Politicians of the Right (towards the fascist right I mean). The right to be rude, to foment upset – to be exclusive and not inclusive. Thank you, Tseen Khoo! Write more! Thanks Tseen for your important article. Your thoughts that: “sometimes, it’s not just about getting the history more correct, or done ‘better’, and having it known”” does not adequately engage with the complexity of this issue. War involves trauma on all sides and working through what people consider to be threats requires an enormous capacity and energy to hold them all together in love. It’s just as important for Aussie War Vets who fought and sacrificed for a particular narrative to be heard (known) and respected as it is for other voices who haven’t been heard and respected to be able to speak from their perspective. When I was working in a hospice, there were Asian nurses who looked after Aussie diggers in their dying. these diggers got deeply distressed at waking up to see what they perceived to be a “foe” in their minds. The kindest and most ethical thing to do was to keep a caim of safety around the dying person as that dying person needed at that time, and let these same nurses care for others with the same kindness they were also capable of. Some things need a respectful distance to be helpful in given situations. Living life to the fullest – regardless of the situation- needs to be attended to in ways that enable that to happen.